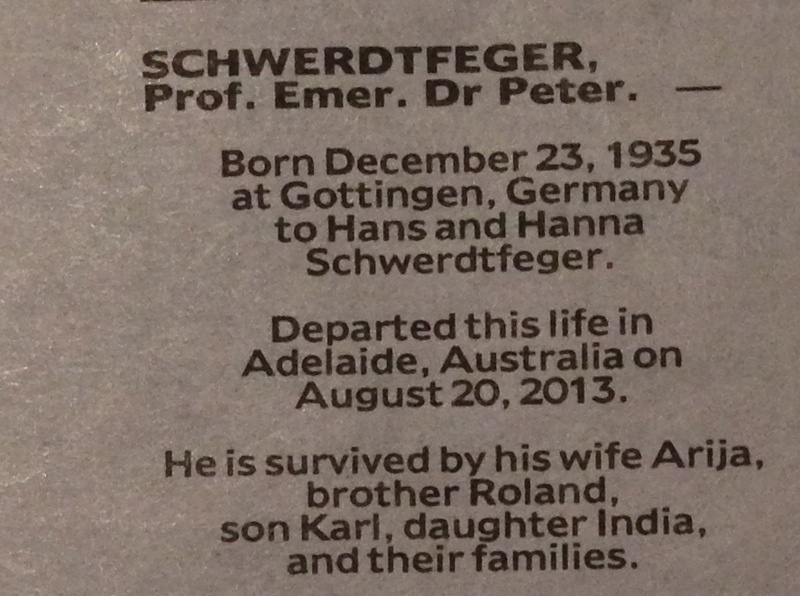 it was interesting to read the obituary for my father, Emeritus Professor Peter Schwerdtfeger, which appeared to be largely a condensation of the words I read at his funeral salted with snippets from his correspondence. At least these parts were factually correct. I do think though that Don and Joyce Schulz would have been rather surprised to find themselves referred to as Eyre Peninsula farmers. Mr Schulz was the driving force behind SOLA Optical and an autodidact upon whom Flinders University later conferred an honorary Doctorate of Science [at my father’s urging]. I first met Peter in 1997, when I joined the Earth Sciences group at Flinders as one of the new staff in hydrology. Peter and I co-taught first year surface water hydrology that year – and it was fun. Peter was certainly one of the most interesting, interested and colourful Earth Scientists … It was both an honour and privilege to work with and learn from Peter. It is impossible to both summarise and do justice to Peter’s illustrious career. 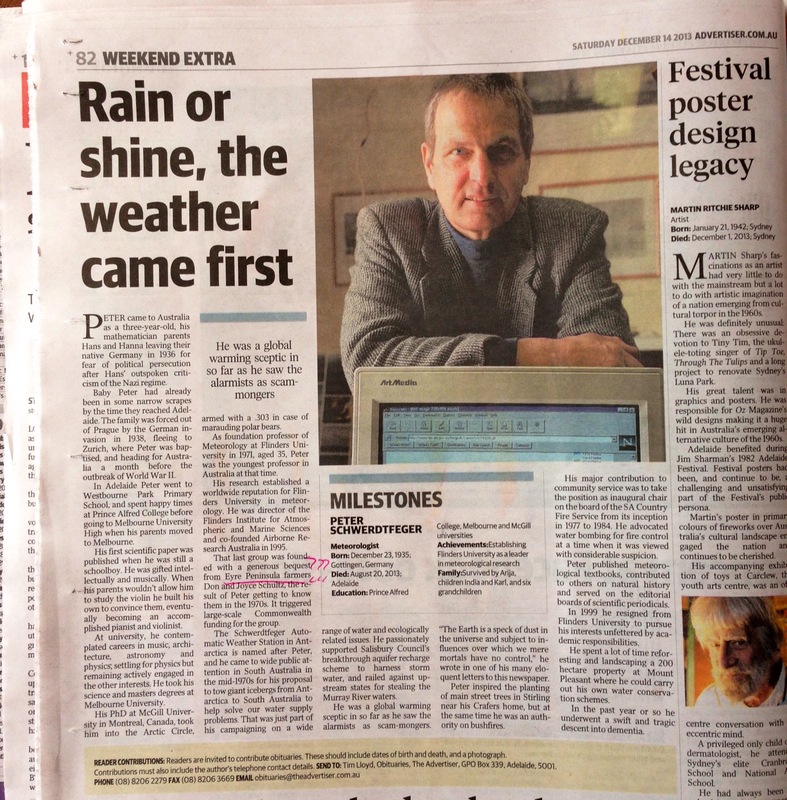 He achieved so much as Foundation Professor of Meteorology (1971), putting Flinders “on the map” in terms of Atmospheric Sciences; as Director of Flinders Institute for Atmospheric and Marine Sciences, which still has a great reputation world-wide; and Co-founder (1995-96) (with A/Prof. Jörg Hacker and Prof. Neville Clark) of Airborne Research Australia (a Major National Research Facility at Flinders University). He both enjoyed and contributed to many professional activities, such as his service as President, Australian Association of von Humboldt Fellows, amongst a very long and distinguished list of service and leadership. Through his wide-ranging professional service and prolific engagement with media, politicians and communities, we see just how interested Peter was in bringing about change, making a difference and in being useful. Peter was a natural, gifted and highly accomplished academic, and he was also drawn to and driven by direct knowledge and first-hand experience. 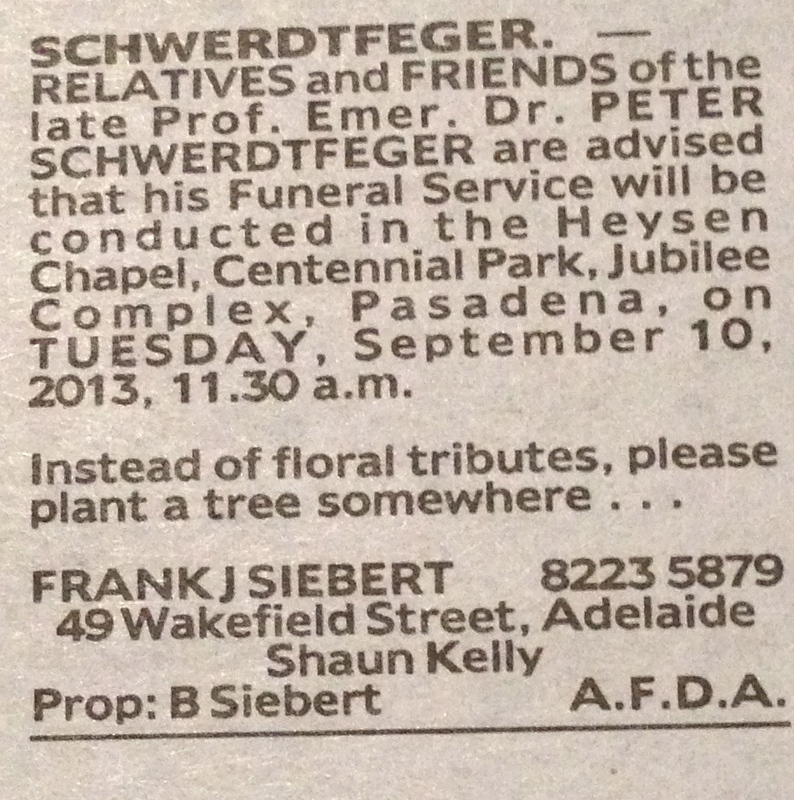 Finally but by no means least, Peter Schwerdtfeger was the person who made first contact with the late Don Schultz during one of his talks on Eyre Peninsula in the late 70’s and that was the basis of the generous donations Don Schultz and his wife Joyce made to environmental research at Flinders University. Without their substantial and future-focussed donations and Peter’s own gargantuan efforts on Flinders’ behalf, Flinders would never have received the multimillion dollar grant from the Commonwealth to set up the National Research Aircraft Facility. The Schultz bequest has supported a wealth of environmental research, conducted by Centres including my own (the National Centre for Groundwater Research and Training) and a personal Chair named in Don Schultz’s honour. As Inaugural Schultz Chair in the Environment at Flinders, I am in tremendous debt to and have deep gratitude for Don and Joyce Schultz, and to Peter, without whose vision, dedication and hard work none of this would have been possible. In many respects mine is a Schwerdtfeger-Schultz Chair, and I think both Don and Peter would find this agreeable and amusing, both telling me what to do and both on my back to make the world a better place. Peter was deeply interested in, and derived great pleasure, from so many things outside of work. I enjoyed my visits to “the Loft” when Peter cooked up a storm in the kitchen and we would play duets – Peter on the violin and me on the piano. They were most enjoyable times and I remember them both often and with great affection. Peter was very good at living. Peter was very good at being Peter; generous, flamboyant, insightful, intelligent and ever fond of the odd elaborate linguistic indulgence and always at the ready with a pithy quip or elegant epithet. Peter has left a very large, deep and positive footprint. The results of his vision, passion and tireless work have reaped, and will continue to provide, tremendous rewards for many generations – past, present and future. Peter pointed the way and cut the path – it’s now up to us to take up the challenge. “The Prof” as he was affectionately known, will be greatly missed. A tough act to follow. Peter was always keen to deliver a comment and a few thoughts to any assembled gathering. It is at just such an occasion as this he would spring to the podium and impart a few words of wisdom if not a lengthy monologue. So I’ll do my best colour with observations I believe he would appreciate. Whilst regularly displaying the airs of academic elitism when mixing it with the dreaded university administrators and politicians, his true character, a “Mensch” was exhibited when dealing with his friends, students and members of the broader community . Mensch, a German word which in Yiddish, meaning “a good person”. A fitting use considering his affinity for the Jewish people and his Israeli friends. His willingness to accept and embrace all is evidenced by a large population of his former students that have settled and achieved success across the globe that not only remained in contact but also close friends and further more in recognition of not only his continued academic status, reciprocated his past generosity with invitations to conferences overseas. This egalitarian and magnanimous streak was also extended to many of the visitors to our house. It was in the early seventies that Mr Bosisto arrived with his tanker truck to empty the septic tank . Yes, and upon arrival I believe my father even shook his hand. Further more, upon completion of said task Mr Bosisto was then invited in for coffee. This could well be dismissed as simply taking advantage of the man in having a captive audience to whom he could show off his shiny new Atomic coffee machine – and we all know of his love of gadgets especially those that made coffee. But no, I am sure that invitation was an expression of gratitude for a job well done and also an opportunity to satisfy his own inquisitive mind regarding this humble mans own unique history. An environmentalist, musician, pilot and scientist would well qualify Peter to be described as something of a renaissance man. Another talent, his architectural skills were put to use in the design of the Mt Baw Baw A.N.A.R.E. ski lodge. Together with his Australian National Antarctic Research Expedition colleagues they built this lodge on their weekends in the 1960’s. Maverick perhaps may well have been a more appropriate title considering some of the escapades in the excavation of the earthworks, that being for the septic tank (sorry for the twice referencing septic tanks – but he did enjoy his poo jokes). When the prescribed number of sticks of dynamite did not satisfy Peter’s impatience for getting the job done the additional number did. A gaping hole in the ground, job well done . On the other hand the flying shrapnel of rocks resulting in a gaping hole in the roof of the neighbouring lodge as well. A maverick in his ideals. An uncle recalled many years ago that Peter dismissed Time magazine as an agent of fascist propaganda and American imperialism. An opponent of the Vietnam war, Nixon, the Iraq war and all the grovelling Australians politicians that followed these misguided causes. He could see through such frauds with tremendous clarity. Again university administrators with similarly perverse agendas. An essential teaching; to question the wisdom of those in authority as it has been shown time and time again that such powers are granted to those with the greater political skills and not rational and humanitarian thinkers. So, a socialist, admirer of working class (the doing class) and condemning of those sitting behind computers. Yes, again, I am sure you have all endured his rants regarding university administrators. These ideals were further enhanced once in retirement and introduced to the everyday workings of country life. His admiration for the people toiling outside of the hallowed walls of academia, those that with their innate intelligence and years of acquired skills and knowledge. A doing class that produced something tangible everyday. Later in life he did succumb and subscribed to Time magazine. I can forgive him these indiscretions considering his state of mind. With consideration of the election of our new prime minister he himself understandably today would not have been as forgiving of the Australian voting public. Considering his own somewhat harsh upbringing I can accept what many would consider his somewhat authoritarian brand of parenting. Perhaps even dictatorial though definitely benign. Going against a family tradition of studying the sciences, Peter was still an enthusiastic supporter of India and me following careers within the arts. India studying architecture, followed many years with the arts council and now a sought after teacher of natural dyeing techniques, and myself pursuing a career as a photographer. Only once did I hear any negativity regarding our career choices and that was at the age of 75 when his illness was well advanced I heard him muttering under his breath “what is this being surrounded by artists and photographers…) well at this point in his life I could well excuse him. A father may well prefer offspring to follow in his own footsteps though he did well to suppress these thoughts for thirty years. His grand children were a tremendous source of pride. Lottie with her degree from the VCA, Isa’s amazing culinary skills, Otto’s photographic abilities, Christian’s technical abilities and acceptance to law school, but especially Rosie having achieved a B.Sc. [Hons] in mathematics and Mara, striding forth with her viola. Mara especially feeling the loss of a grandfather and the number one ticket holder of her fan club. Peter having travelled several times in recent years to see Mara perform in Sydney. achievement of two parties to be acknowledged, that of both my mother and father in 55 years of marriage. My father caring for my mother during her many health scares in the last thirty years. Arija then regaining her strength to care for Peter at home in the years leading up to his last year at Burnside Regis. A stressful time indeed and particularly taxing upon her own health. It’s the same old story that only in this moment of reflection does one truly appreciate what is now missing. I will miss the times we spent building a jetty in the dam. His joy at watching his grand children endlessly running and jumping into the icy water. I will miss the times he then made pizzas for his grand children’s lunch. My father, Peter Schwerdtfeger, known to me as Pa, his grandchildren as Opa, to his friends as Peter and to his many students simply as Prof was a consummate polymath of fascinating contrasts and a multiplicity of interests. We remember him as frequently eccentric, often brilliant and always dedicated to his work. As a child I don’t recall him sitting still for longer than it took to down a cup of coffee, unless he was sitting at the piano or the typewriter. He was shaped by a peripatetic childhood, his parents leaving Germany for political reasons when he was still a babe in arms. His education began at the Russian kindergarten in Prague at a mere 18 months of age and was interrupted by the German invasion of 1938. The family fled to Switzerland where my father was baptized in Zurich cathedral. Their stay in that small country was brief however and as my grandfather was determined to put as much distance as possible between himself and the Nazis the small family arrived in Australia in August of 1939, literally moments before Europe erupted into chaos. Pa’s education continued at Westbourne Park Primary school under the sketchy guidance of teachers whose attitude to small boys with German surnames was conditioned by their experiences in the first world war. As a consequence his early schooldays were often uncomfortable. Some years later he transferred to Prince Alfred College, which seems to have been an improvement in circumstances [in recent years he was certainly an enthusiastic participant in the PAC Old Old Boys]. Sadly his days there were cut short by his parents deciding to transfer to Melbourne. From academic beginnings [to quote him directly] as a grease-monkey on a cyclotron [which he was involved in building] he was awarded an MSc at Melbourne University, followed by a PhD at McGill University in Montreal. Adelaide and the Mount Lofty Ranges continued to hold a place in his heart so when he was invited to take up the foundation Chair in Meteorology in 1971 he accepted with alacrity. In doing so he became the youngest professor in Australia at the time. This gave him particular delight. At heart he was not just Peter but Peter Pan, the boy who never grew up. I recall it pleased him enormously when my fellow students at Adelaide University assumed he was my brother when he occasionally called into the Architecture studios. He remained Professor of Meteorology until he resigned in 1999. The list of his achievements is far too long to read in full here, so I will be brief. In 1977 he was invited to chair the inaugural board of the South Australian Country Fire Service, a position he held until 1984. In the early 80s he achieved his ambition to fly, gaining both solo and twin engine endorsements. He was the foundation president of the Australian Association of von Humboldt Fellows, continuing in that capacity until 2009. The Association has established an annual award in his name. In 1988 he was elected a Fellow of the Australian Academy of Technological Sciences and Engineering. 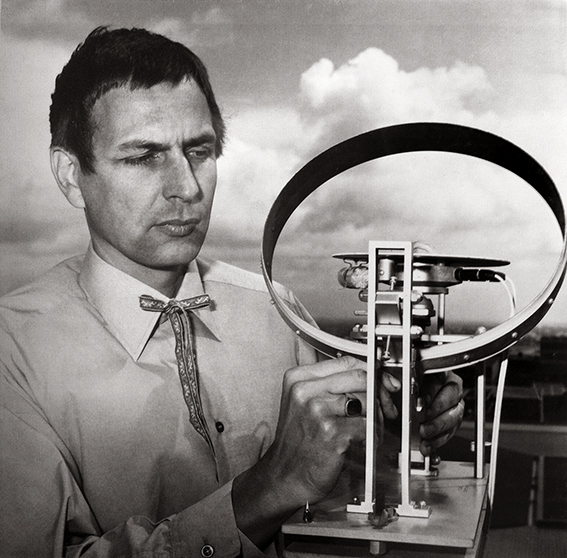 In 1991 he was awarded the prestigious Max Planck Research Prize together with professorial colleagues Hacker and Kraus; cofounding Airborne Research Australia with the former in 1995. My father was a keen gardener who enjoyed shaping landscapes, building stone walls and planting trees. The glorious avenue of liquidambars [now listed on the national register of significant trees] that bring colour to the main street of Stirling in autumn each year are there thanks to my father mobilising fellow tree lovers in the local community and organising their planting in 1972. He was an enthusiastic if occasionally misguided cook. Sometimes it seemed as though he had a mission to bring breadcrumbs to the whirled, including them as a key ingredient in pasta, pancakes and even pumpkin pie: his ability to cover every horizontal kitchen surface (and a good many vertical ones ) with flour is the stuff of legend. I have been trying to expunge the memory of his interpretation of poulet au cocacola for over thirty years and if I may borrow from a movie popular late in the last century… The recipe for spam and aubergine pizza fortunately goes with him to his grave. His baumkuchen, on the other hand, prepared annually to distinguish my mother’s birthday, was exceptionally good. My father loved music and as a small boy longed to play the violin, an ambition his parents did not take seriously until he actually built an instrument for himself, whereupon they relented and allowed him to take lessons – on condition he confined his practice to the shed at the bottom of the garden. Despite this daunting beginning he persevered and by the time he had completed his secondary schooling at Melbourne University High had attained concert standard on both the violin and the piano. As a child one of my great pleasures was to sit underneath the piano as he thundered out a Bach prelude at the end of his working day. I recall asking him why he had not pursued a musical career. His response was unequivocal, declaring that he had given his four major interests [music, astronomy, architecture and physics] equally serious consideration when deciding on potential tertiary study; and that he had decided to keep the first three for recreational purposes, primarily because he hoped that a career in the sciences would always offer him new challenges and the potential for discovery. He indulged his interest in architecture by shaping our living environment – I don’t recall any of the houses in which we lived being without a construction of some kind in process – as well as designing both the ANARE Ski Lodge on Mount Baw Baw and the Melbourne University meteorological research station at Mount Derrimut. I recall the latter as an elegant post-modernist arrangement of two equilateral triangles connected by a glass bridge. His fascination for astronomy was furthered by building a telescope from an old artillery shell, beginning with the grinding of the lenses. Pa was the only person I know who could choose to speak French with an Indian accent. It was hilarious. He gave me the gift of curiosity and showed me the joy to be found in words, instilling a love of language in his grandchildren as well. His pithy dismissal of persons who had incurred his disapproval as ‘quivering masses of gelatinous protoplasm’ puts Paul Keating’s invective firmly in the shade. Pa’s first scientific paper was published whilst he was still a schoolboy setting the foundation for a prolific catalogue. He published several meteorological textbooks, contributed to other volumes on natural history and served on the editorial boards of a number of scientific periodicals. I think that of the International Glaciological Society may have been his favourite. His descent into dementia was swift and tragic and the last twelve months of his life can only be described as a living hell. It is hard to say exactly when I realised that the father I had known and loved had slipped away and been replaced by a being who seemed to actively dislike me and with a propensity for arson, but from the middle of last year it became clear that he would need to be confined, for his own safety and that of others. Visits to him were sometimes difficult as he would run away when I came into sight. At other times I was able to connect him to his brother in Colorado thanks to the miracle of the modern pocket telephone. Somehow our last visit together was surprisingly pleasant. I had brought him a book about his beloved polar regions and many of the images triggered lucid memories of his work in both. At the conclusion of our afternoon together he whispered that he hoped he would survive until I returned.